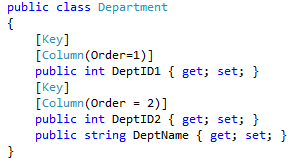 Entity Framework usually generates Tables with plural names. For example, a Student class would generate a table Students. This could be a little inconvenience for teams who insists on plural names. The solution is to override the ‘OnModelCreating’ Method to remove the plural features. This would ensure plural names are used in every concerned Context. Now the question is, what if we need to give plural name only for selected table names. This would ensure that the Standard Table is created with a plural name. Overriding OnModelCreating is very useful method to have when you need to provide customization of tables that is being generated by Entity Framework.